Starke, Fla., Bradford County seat, now has another claim to fame beyond its notoriety as a speed trap. Starke hosts the nation’s first atheist monument on government property, a combined pillar and bench at the Bradford County courthouse installed on June 29 by American Atheists, Inc. (AA). Between 200 and 300 people attended the dedication ceremony, along with Confederate-flag-bearing protestors and a noisy “Honk for Jesus” crew across the street. 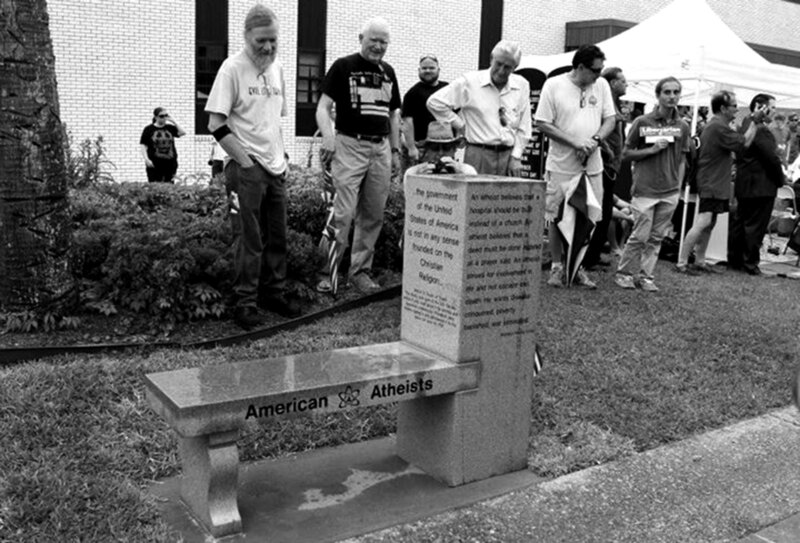 In the spring of 2012, a local Community Men’s Fellowship spent an estimated $20,000 to place a 3-ton marble slab bearing an abridged Ten Commandments in the courthouse entrance area, promptly triggering a lawsuit from Starke resident Daniel Cooney and AA. The plaintiffs charged that parking the large display of a religious message in that location violated the First Amendment to the U.S. Constitution, favoring one group of believers while alienating all others, and asked that the monument be removed. A year later, a settlement emerged: the monument would stay, but part of the courtyard was declared a “free speech zone” so that other groups could express differing viewpoints. Making lemonade from their loss, AA commissioned “a monument to our secular nation”—a 1,500-pound synthetic granite bench marked with AA’s name and logo, joined to a 5-foot pillar, bearing quotations from three “Founding Fathers,” the first U.S. foreign treaty, and Madalyn Murray O’Hair (who founded AA 50 years ago), plus a brief analysis of biblical punishments for violating the commandments (mostly death). None of the speakers observed that the original monument, which had caused all the turmoil, was a “For Dummies” version, and arguably an insult to both Jewish and Christian traditions. Though written in imitation 17th-century English (“Thou shalt…”), the Bradford County Decalogue has a mere 67 words—the King James version of the same text [Exodus 20:3-17] has 297. David Silverman, president of American Atheists, announced that an anonymous donor had contributed enough money to build about 50 more such monuments. This entry was posted in Articles, July-August 2013. Bookmark the permalink.